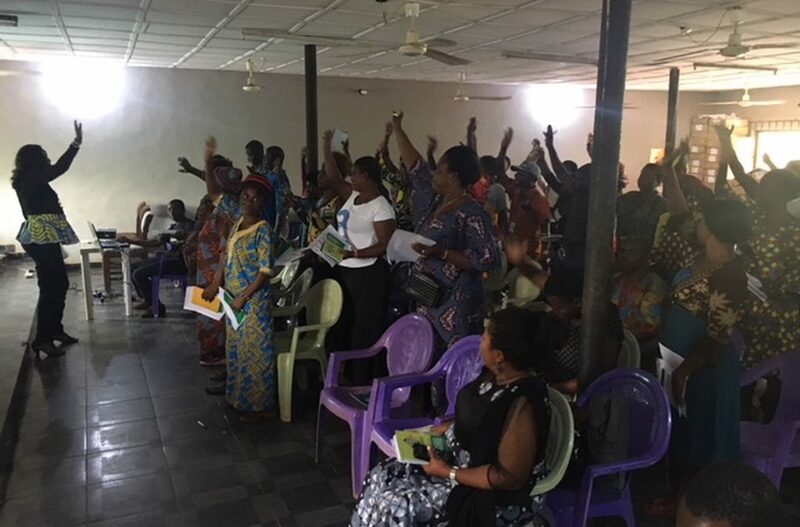 Health of Mother Earth Foundation hosted a Community Dialogue on Food and Farming Systems in Nigeria on September 21, 2018, at Ugbiyoko Community in Benin City with about a hundred farmers from various communities in Edo State participating. The Dialogue provided a platform for examining the challenges facing agricultural production and the special threats posed by opening of the flood gates for Genetically Modified Organisms (GMOs) to stream into Nigeria. Discussionr were also held on the way forward for improved agricultural productivity with emphasis on agroecology and support for smallscale farmers. In his opening words, Nnimmo Bassey, Director of HOMEF, stated that dialogues such as this are vital for sharing ideas, best farming practices and ways of preserving our seeds and our overall biodiversity. He reminded all that small scale farmers are the main food providers to more than 70% of the world’s people and that they produce this food with less than 30% of the resources – including land, water and other inputs. The industrial food system under which agricultural modern biotechnology thrives, however, uses at least 75% of the world’s agricultural resources, is a major source of Green House Gas emissions yet provides food to less than 30% of the world’s population. Mariann Bassey-Orovwuje, Chairperson of the Alliance for Food Sovereignty in Africa, in one of the presentations that preceeded the dialogue, stated that although attempts to overcome agricultural challenges have led to many innovations and have resulted in production of improved natural crop and livestock varieties, corporate industrial systems attempt to control food production and displace small scale farmers through the push for genetically modified crops. Her presentation made it clear that a majority of small-scale farmers have no idea what GMOs are about and what threats they pose to their health, environment or livelihoods. This was obvious as about 98% of the farmers gathered had not heard of GMOs. The food sovereingty activist pointed out the risks agricultural biotechnology poses to small scale farmers and consumers at large, included diseases resulting from the use of toxic chemicals, soil degradation, and the loss of farmers‘ right to save and reuse seeds. Adeoluwa Olugbenga, senior lecturer of agronomy at the University of Ibadan, speaking on Agroecology,Securing Farmers‘ Income and Agricultural Productivity in Nigeria, noted that to improve productivity, there is need for proper understanding of agroecology management and practices. This also ensures the sustainability of their agro ecosystem and increase in their income levels. This session enlightened the farmers on natural indigenous practices that can be used to combat pests and diseases, improve productivity in minimal land space and replenish the soil health in the process. During the dialogue session, the farmers discussed in groups amongs other things the major challenges facing agriculture today. They lamented that in addition to shortage of capital, they had challenges with availability of land as it is being taken up for development projects. They also complained of bad roads and high transportation costs, unavailability of seeds, lack of processing facilities and invasions by pests and diseases. The farmers also discussed the solutions to these challenges. The farmers which included crop and livestock producers expressed gratitude to HOMEF for the enlightenment and acknowledged that they needed more of these dialogues and training. They rejected GMOs and with one voice and called on the governemnt to provide them with more support to improve productivity with local/indigenous varieties. Gloria Okon, one of the participating farmers from Katsina State, acknowledged that the Community Dialogue was very useful. According to her, “it helped her as a farmer know how to farm without using chemicals and also to know the difference between GM seeds and natural seeds.” She saw the use of accessible language, especially pidgin English, as key to making the meeting successful. She added that she would organize similar dialogues for other farmers in her state. The government through its Ministries of Agriculture should devise strategies to combat the use of harmful chemicals and pesticides by farmers. Focus should instead, be on promoting safe natural/traditional means of pest and weed control. Extension officers should be trained and stationed in farming communities to share knowledge on agroecological methods of agriculture that build on practices developed over the millennia. The Government should make provisions for rural infrastructure, storage and processing facilities and financial loans to assist farmers. There should be land access to farmers and gender equity should be enforced. Farmers should form coorperatives within and accross communities to facilitate exchange of both ideas and inputs. Children and youths should be carried along in agricultural practicies to ensure continuity of indigenous knowledge. Civil Society groups should intensify enlightenment programmes and continue to amplify the farmers‘ voices. GMOs are harmful and not needed. The government should place a ban on GMOs and urgently carry out a radical revision of the National Biosafety Management Agency (NBMA) Act 2015 and install a neutral Biosafety Regulatory Agency that will put the interest of the people first. Some of the communities represented who signed on to the resolutions include:Ugbiyokho, Utagban, Evbuodia and Uholor Communities in Edo State. Organisations represented were: The Alliance for Food Sovereignty in Africa, Association of Organic Agriculture Practitioners of Nigeria, Health Promotion Education and Community Development Initiative, Nigerian Women Agro Allied Farmers Association, Idama Coorperative Farm, Ibaji, Women& Children Life Advancement Initiative and Health of Mother Earth Foundation.